Fascinating note as president to the assistant Secretary of state William H. Trescott. 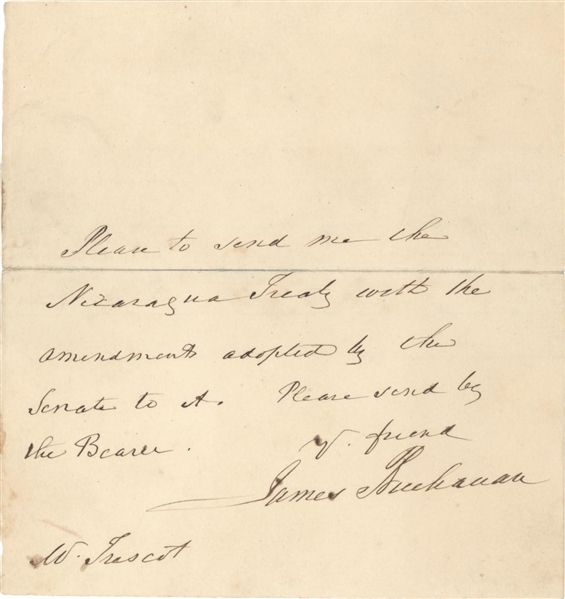 Buchanan asks ”that he please send him the Nicaragua Treaty with the amendments adopted by the senate in it. Please send by the bearer to W. Trescott. Buchanan was very active in trying to control Nicaragua and wanted to build the canal there. Buchanan had the filibuster William Walker arrested after setting up a dictatorship in Nicaragua's Mosquito Coast, but the Department of State released Walker, who claimed that he had been acting as Buchanan's agent. Nicaragua denounced Buchanan for his interference in its affairs. After long negotiations with the British, he convinced them to agree to cede the Bay Islands to Honduras and the Mosquito Coast to Nicaragua. However, Buchanan's ambitions in Cuba and Mexico were largely blocked by the House of Representatives. did separate at fold line with old repair, but does not affect the writing.